Felix and some non-Felix cannon fodder. Festivities start at 7:10. I sat next to him one time at a baseball game. He is nuts. hahahaha! Red got mentioned on TV! Red just got mentioned on the radio. Great shot of Red and mention by Sims just now. How awesome. Is this true even in the 8th inning? I hate sac bunts too but I thought this is one situation where it is called for. JJ looks rusty, not surprisingly. But he does know how to go after an inexperienced hitter (AJ). I really missed this over the last two weeks. I wanted a Mariners victory AND an Obama victory. Welcome back, JJ, we missed you. Too bad Felix didn’t get the win, though. I’m with you, Lauren. Can someone tell me how he looked on the radar gun with all the pitches he threw? Really surprised that Trembley let Guthrie stay out there. Walker would have been a good matchup against Ibanez, and Sarfate would have been a good matchup against Vidro. Cliff really came through tonight. And is it my imagination, or is Huff one of those weird guys who always hits the Mâ€™s well? Huff is a left-handed hitter with a bit of power. 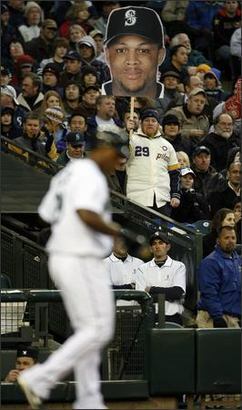 Safeco treats guys like that very well, making them “Mariner Killers” (c.f. Anderson, Garret). Mark Lowe hid in JJ’s locker behind some coats to pie him in the face, that was nice. boy, real life interrupts and you miss the go ahead runs, JJ’s return and some really stupid posts apparently worthy of rapid banishment. He did what he had to do, get a base hit. I guess that’s what makes him a professional. HamNasty, I am envious. I pulled an allnighter to start a research paper due on monday…and had work all day yesterday, went to library, went to class at 8, then work, then class, then class, and now home to find out the Mariners won (YAY) and Obama lost (boo). Its been an up and down 48 hours. A female streaker, a drunk wannabe model fighting an old lady, and some poor pitching would have been nice. And I bet you got beer. And it was cold. At least for a few minutes. Why do I listen to the post game shows? They were talking about Frank Thomas, pointing out that Frank’s best years are behind him, that he gets on base a lot but is a base clogger because he’s slow, and that driving the ball in SafeCo is hard. Then they go on to praise Vidro. There was the humorous moment with Mark Lowe giving J.J. the shaving cream pie. He didn’t just pie him, he made sure to get in mic range to say “Welcome back Big Guy!” in a really nasally mocking voice. So HamNasty, the question becomes… was the streaker pretty? OMG!! What in the hell is wrong with you!? Do you want the Mariners to figure out that left-handed power is worth more to them than 75% of the teams in the AL? The Vidro turnaround has begun. Seriously though. I’m happy the M’s won, I don’t care who gets the hit. Those of us who think Vidro is finished as an everyday player don’t root for him to fail to prove our collective point. No one cheered louded than me when Vidro had that hit last night. Multiple delusions. Try it sometime.